While in many places the tradition has died, spring used to be the time when bock beer was released, much to the delight of beer lovers – especially those of German heritage. As far back as Medieval Germany, people would typically drink a slightly lighter lager style beer most of the year. Meanwhile, bock beer was aged over the winter and fermented with bolder malts, creating a beer that not only was darker in color and bigger in flavor, but which also was about double the alcohol content. That was actually intended to provide a bit of extra nutritional value during Lenten fasting, but on “Bock Day” it also meant a fun time for all, as it coincided with a celebration that signified the coming of spring and, hopefully, better times after a long winter. The name “bock” is actually derived from the Medieval German brewing city Einbeck; bock also happens to be the German word for “goat,” so as modern times approached, including in early American German settlements, signs and posters advertising the annual release of bock beer bore the likeness of goats. Sometimes actual goats would even get involved in the festivities as mascots. And the legend of how bock beer was “discovered” is quite a yarn in itself. “It is legend that Jan Primus, or John First, whose name has come down to present times as ‘Gambrinus,’ had a vagabond serving man who ran away from his master and carried with him two stone bottles of beer with which to refresh himself on his travels. He drank the first bottle of beer and then buried the other until he required it. But he wandered far and it was not until hunger drove him homeward that he came on the place where he had buried the bottle of beer. “It had had several months in which to ripen, or ‘lager,’ and the serf was delighted and surprised to learn that it had greatly improved in quality and flavor, and being a wise knave, he saw his chance to make favor with his master and escape the punishment which he rightly anticipated. 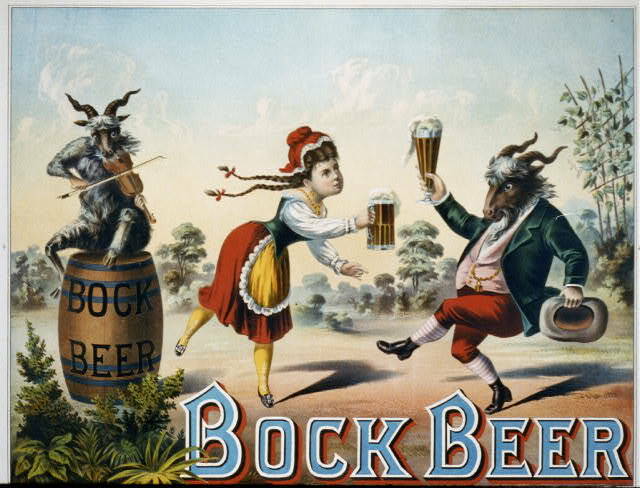 Bock Promotion 1882, courtesy Susanlenox. Is the legend true? Eh, who cares. It’s a good story. And bock is good beer. 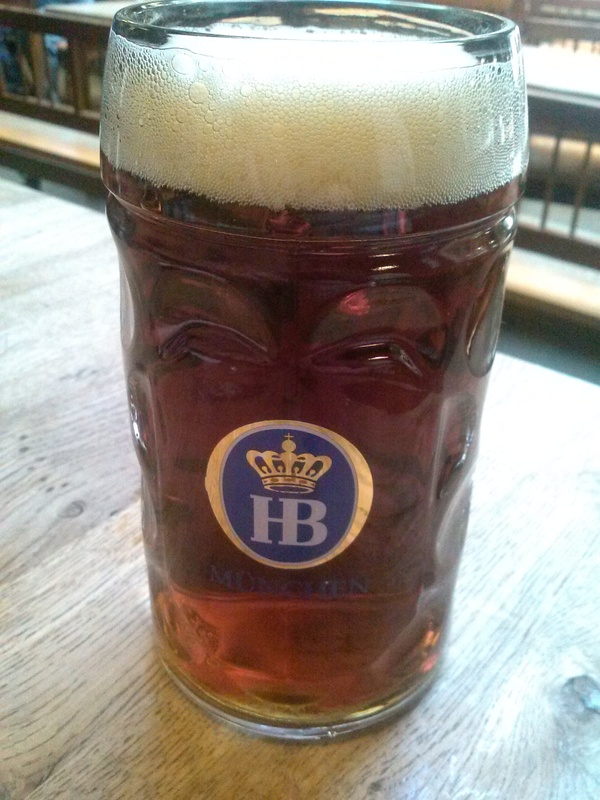 I recently visited Hofbrauhaus in Newport, Ky., where Doppelbock was tapped for the season, and it was a delicious specimen – thick, rich, malty, slightly sweet and even just a tad chocolaty. It was also 8 percent ABC, so I only drank one. Nearby Cincinnati is home to the oldest and largest annual Bockfest in the country in its historic Over the Rhine neighborhood, where much of the city’s brewing history is rooted. People gather to eat bratwurst and Rueben sandwiches, to celebrate spring, and of course to drink as much bock beer as their bellies can hold. A huge parade leading to the “blessing of the kegs” is led through town by a goat pulling a barrel of bock beer and the reigning Sausage Queen from the year before. Steven Hampton, Executive Director of Over the Rhine Brewing District, said the annual festival, which involves at least a dozen of the neighborhood bars and pubs as well as a big Bockfest Hall with plenty of taps and tables, carries on the tradition of Bock Day in a very local way. Of course, that’s how it was in the old days – you went to your nearest pub and drank with your friends and neighbors. Many back in the late 1800s and eary 1900s in German communities in America would take the day off from work to celebrate the coming of spring. Bock beers should be out in abundance, so next time you stop in your favorite watering hole, check out what bock or doppelbock beers are available – Ayinger Celebrator is a good choice, or if you want something bit less bold, Shiner Bock is a fairly solid beer. Just remember that most of them pack a punch. In other words, celebrate the coming of spring, but drink bock beer responsibly.